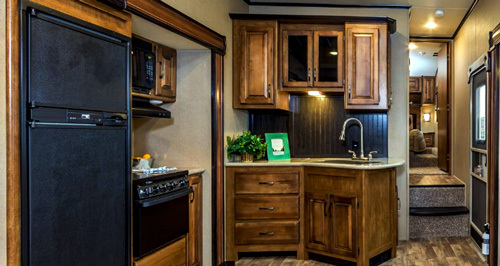 Grand Design RVs (travel trailers and fifth-wheels) are recognized for Residential Luxury and Value (read it “Proven Quality”). Why the latter is the result of GDRV’s policy of rigorous control and extra 100% Pre-Delivery Inspection, the residential-like luxury usually is coming with size and correspondingly weight. GD’s Reflection 27RL 5th wheel trailer proves that thanks to good engineering effort it is possible to “pack” these attributes into smaller and reduced-weight camper that can match the towing capabilities of popular trucks. And this opens the whole new word for the camper, as suddenly it becomes an attractive choice for the large group of potential customers already owning full-size pickup trucks…. 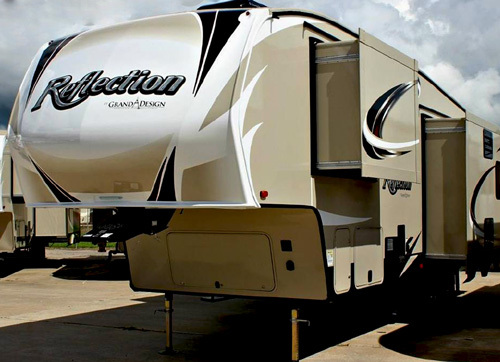 Indeed, the Reflection 27RL with its length of slightly less than 32 feet and dry weight of about 8k pounds (modest as for the class of luxurious RVs) falls into the category of mid-size campers. That is why the 27RL found its well-deserved place on our list of top fifth wheels for 2017. The Reflection 27RL maybe more than other GDRV’s campers justifies the name “super-light”. The structure (mostly aluminum body frame and laminated aluminum walls) is not only lite, but also elegant and stylish as expected for modern high-end campers. 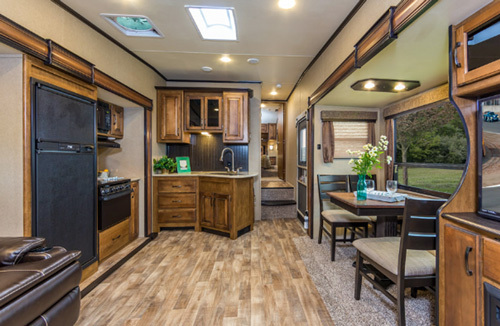 Two large slide-outs in the Living / Kitchen / Dining area and the smaller-one (wardrobe) in the master bedroom make the whole camper roomy and functional. But what really brings (and keeps) its “residential-like’ warmness and “feel” is the high-end “finish” (furniture, appliances, Corian-like countertops and “thousands” of small but important details that make difference). It’s needless to repeat here how important is a good sleep. 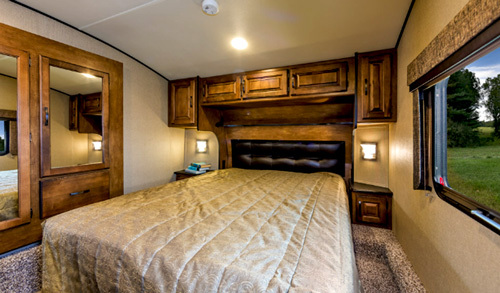 Certainly, 27RL’s bedroom with its queen-size “walk-around” bed and high quality “pillow-top” mattress promises comfort. Two bedside night-tables offer individual spaces for “before-the-sleep” book, iPad (unfortunate “partner” of our lives till late hours), but on the more positive note – also for freshly brewed cup of morning coffee. The street-side slide-out houses large wardrobe with two sections for hanging clothes and drawer. The third section with shelves and drawer is on the bath’s side of the sliding door where its serves as the linen cabinet. But thanks to mentioned private sliding door between the bedroom and the bath it is also very easily accessible from the bedroom. Mirror doors make the bedroom larger than it really is greatly contributing to kind of “anti-claustrophobic” feelings (if any). Spacious overhead cabinets along the front wall and an easily accessible under-bed box add always “much-needed” storage space. The carpeted floor nicely contributes to relaxing, warm ambiance. Finally, let’s note that the Master Bedroom has all necessary hook-ups (power and cable) for an extra TV (just in case you cannot live without). 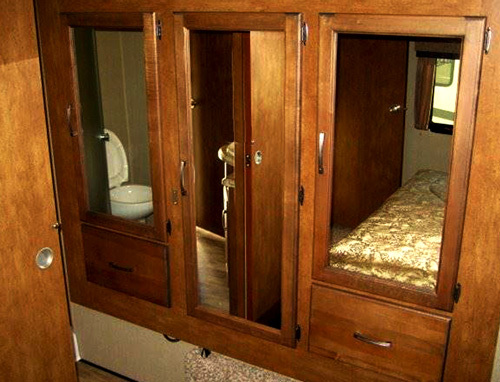 Well, in most mid-size campers a very tight area – this one seems spacious. The radius shower is clearly bath’s focal point. The very large skylight matching the radius geometry of the sower cabin somehow enhances its elegance. But undeniably (together with mirror door of the linen cabinet) it makes the bathroom “visually” roomier and definitely lighter. 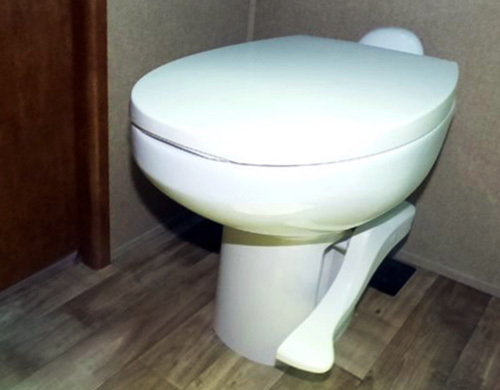 The porcelain toilet with foot-pedal-flush is already a standard even in mid-size campers. However what strikes in this bath is an oversized vanity with large countertop (always needed especially for our “better-halves”). 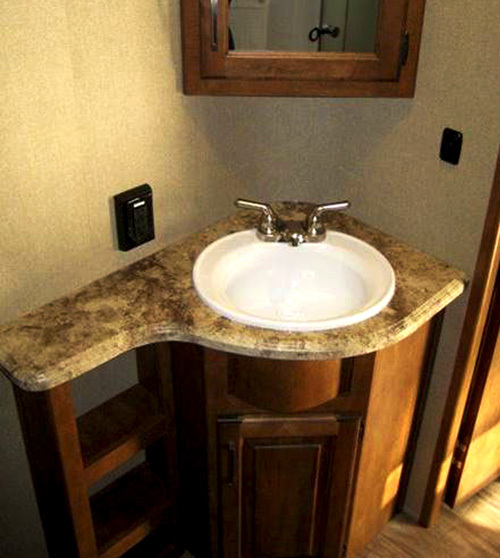 The vanity (and large Medicine cabinet w/mirror above) is designed to smoothly integrate with rounded wall. We also noted small but very useful details like hanger for towels, electrical outlets etc…. The second door leads to the narrow passage linking the bedroom and the living space. The kitchen shares one of two large slide-outs with the living area (actually both of them, because the dining table corner is located in the opposite-side slide-out). It’s an open-design so the kitchen is not “isolated” from the rest of the living space by the central island or U-shaped cabinetry. The kitchen has semi-L-shaped cabinetry facing the bathroom’s wall. 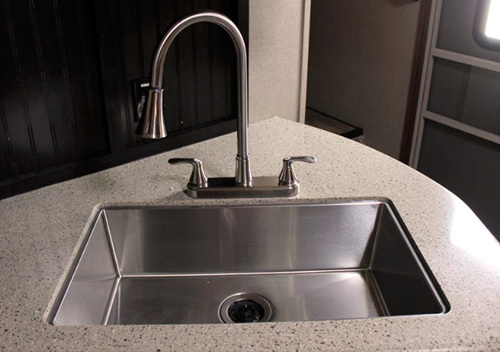 The deep, under-mounted one bowl stainless-steel sink comes with matching countertop solid-surface cover. There is no pantry – some at first may be disappointed, but frankly, the generous space in deep kitchen cabinets should easily meet most requirements including space for a garbage bin …. The 3-burner stove with an oven has easy to clean glass surface. The drawer’s front panel (below the oven) nicely matches remaining kitchen’s hard-wood finished cabinetry. 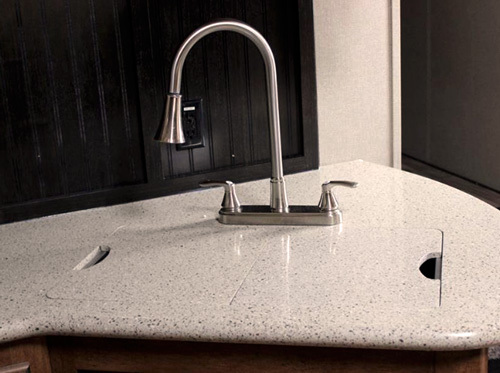 The Corian-like solid-surface countertops offer not only generous working space but also truly residential look! All appliances (stove, microwave and 8 cu.ft fridge with freezer) have elegant black-finished faces. The dinette with benches on both sides makes the standard dining corner. It can be replaced by an optional free-standing table with 4 chairs, and frankly although there is nothing wrong with the traditional dinette, we find that the table much better fits into the residential ambiance. The kitchen and the dining corner make an integral part of the living space. 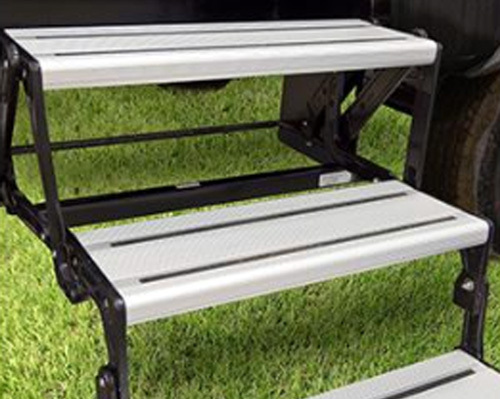 It seems to be the optimal solution for mid-sized campers where the space is priceless. This is because integrating functional sections into single area brings much better effect than partitioning the limited space. And GDRV’s designers did great job by smoothly and seamlessly integrating kitchen and dining area with living and entertainment “quarters”. The theater seats face the entertainment center with HD TV and combinations of CD/DVD/AM/FM/Stereo/ Bluetooth/USB (it seems there is no end) as well as the fireplace at the bottom. 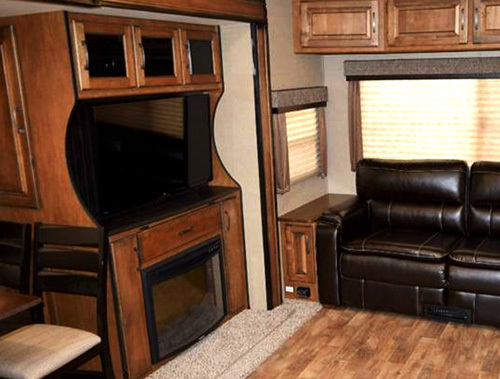 The TV screen and Audio/Video system is housed in the large set of cabinets offering plenty of storage space. Add to that the overhead cabinets and you have pretty good picture of the living space. But obviously in so tight space you may have to come to some compromises – one of them is the side access to the cabinet behind the TV. Most likely you have to move both chairs to have an unobstructed access to this storage space. The Bauxfloor wood imitating linoleum fits into the ambiance (floor in curbside slide-out is carpeted). But there is one technical detail that really puts Reflection 27RL fifth wheel ahead of competition. Heat registers are typically placed somewhere on the floor and by nature of physics (and gravitation) they are prone to “collect” dirt and debris (actually some of them may be “precious”). 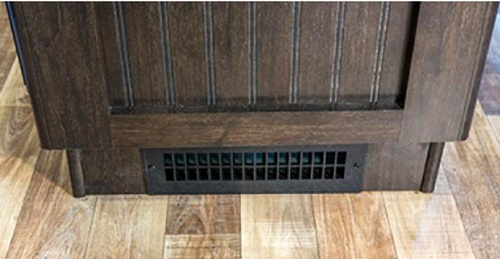 Here the manufacturer put all the effort to place them at the bases of cabinets and even sofa did not “escape” this destiny – the heat register is also at its base. 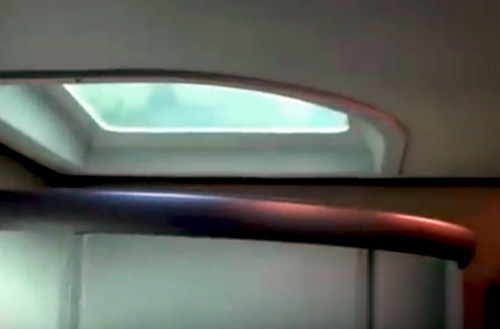 Finally let’s mention large tinted panoramic windows opening the camper into the outside world (hopefully the unspoiled nature), but at the same time protecting interior’s privacy. 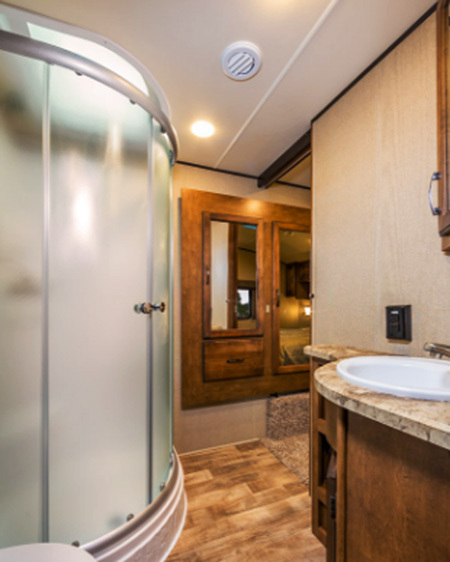 The Pass-Through storage at the front of the camper is designed to store bulky stuff (camping chairs, table, BBQ, exterior screen room etc… ) and whatever you may need especially for outdoor activities. It is well engineered, so all pipes and cables usually seen in other 5th wheel pass-through storages here are hidden behind the walls. 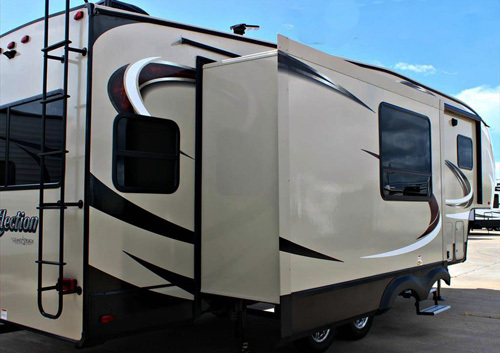 Bottom line – you have an unobstructed heated storage space with light. 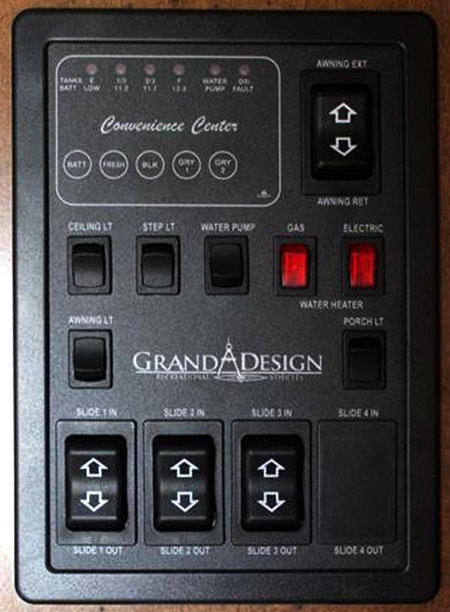 You will also find here the extra 120V AC outlet and Battery Disconnect Switch as well as the control panel of the Automatic Leveling System. The Pass-Through storage has metal slam-latched doors that can be handled with one hand! 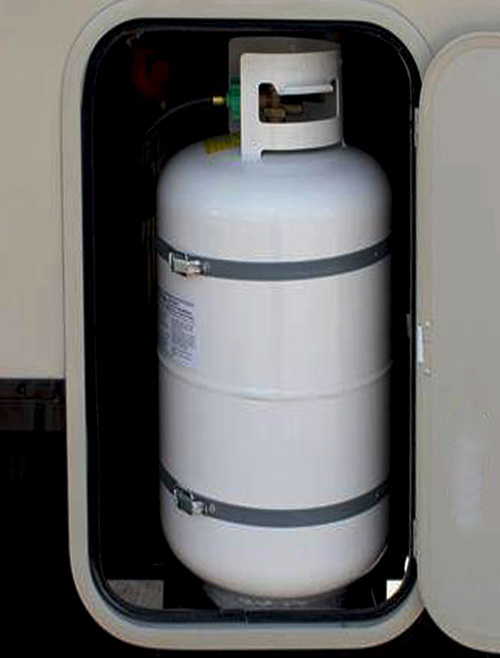 There are also few designated storages - two for LPG bottles and one for the battery. Coming back to the curbside it is worth to mention nice aluminum steps (3) with an anti-slip tape and LED lighting. 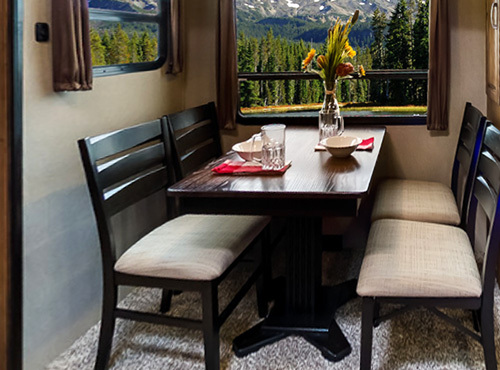 The 13 feet long power awning with an LED strip extends the living area to the outdoors so in favorable weather conditions you can comfortably spend time in a direct contact with the Mother Nature (is there anything better to do when on vacations?). The rear ladder offers an easy access to the walkable roof although there is no factory mounted rack no information about the load you could possibly carry on it (if at all). The GDRV’s Reflection 27RL fifth wheel comes with most features as either standard or mandatory (so from the buyer’s point of view – standard). 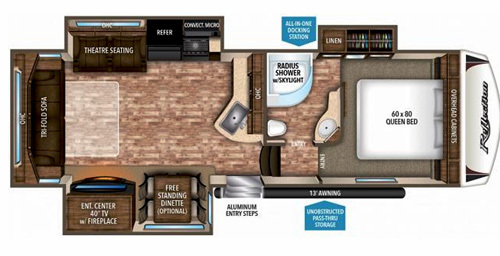 It’s probably company’s policy to make sure that each of their campers keeps-up with the residential-like standard expected from Grand Design RVs. As the result you really have very little choice of options. 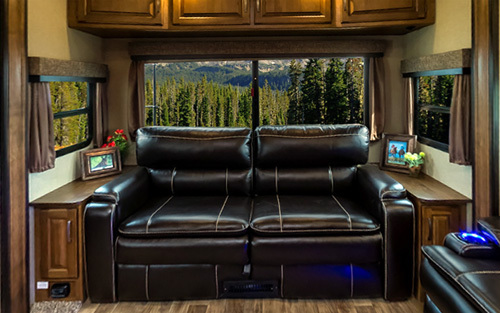 Just to make it clear – the company still lists optional packages like the Ultimate Power Package (UPP), Peace of Mind Package (PoMP) and Arctic 4-Seasons Protection Package (A4SPP), but they are all Mandatory as they include essential features making the camper comfortable, practical and safe. Some of few available options include: Free-Standing Table w/chairs (replacing classic dinette), extra 13.5k BTU A/C for Master Bedroom and Dual Pane windows.